This weekend, several hundred Trotskyists, communists, unionists, anarchists and indigenous activists have gathered in Melbourne Australia to plot the downfall of Western capitalist civilisation. 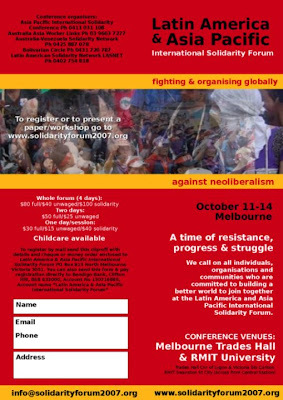 The conference, The Latin American & Asia Pacific International Solidarity Forum is the brainchild of Australia's largest Marxist-Leninist organisation, the Democratic Socialist Perspective (DSP). More than 40 representatives from "progressive" organisations and campaigns in 22 countries will address the forum. They include mainstream communists from Australia, Cuba, Vietnam, Venezuela, El Salvador and East Timor, Trotskyists from Canada, Indonesia, Pakistan and New Zealand and Maoists from India, the Philippines and New Zealand. * Sigfrido Reyes Morales, Member of Parliament, FMLN Political Commission. * Anak Jehudi, Patron, West Papua Students Association, Port Morseby. There are also four New Zealand speakers. The presence of the Workers Party is interesting as until recently there have been few links between the DSP and our local neo-Maoists. Their common interest seems to be support for president Chavez's unfolding Venezuelan revolution. This conference proves several things beyond the obvious "communism is not dead". Firstly it shows the level of integration between the mainstream communist parties of Vietnam and Cuba and the newer revolutons of East Timor, El Salvador, Venezuela, the Philippines and Bolivia. Secondly it shows the growing links beteen the mainstream communist parties and the once hated Trotskyists and Maoists. Thirdly it demonstrates the links beteen the indigenous rights, green, women's, labour movements and the resurgent world revolutionary movement. James McNeish-Communist Apologist or Naive Idiot?